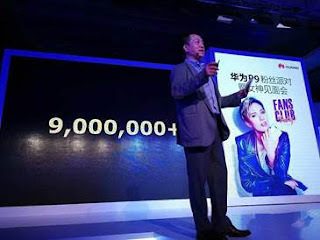 Huawei’s recently launched flagship, Huawei P9 sporting the first of its kind, dual Leica lens celebrates the achievement of reaching 9 million sales on the 10th of November 2016 at Shenzhen, China. As an industry first, Huawei, the world’s 3rd largest smartphone manufacturer, entered a unique partnership with the global iconic camera brand, Leica to offer world class photography experience by co engineering a dual lens camera with Leica in its Huawei P9 giving it a competitive edge. The launch of the Huawei P9 generated considerable buzz in the photographer’s community and gained major traction from many celebrity photographers such as Actor/Photographer Boman Irani, ace fashion photographer Darren Centofanti, CNN instagramer of the year, Sumit Dayal to name a few. The handset was greatly recognized as a magnum opus amidst the fashion fraternity after FDCI announced Huawei P9 as the official camera phone of the Amazon India Fashion Week 2017 at its launch. Gaining immense consumer attention in the Indian market and globally Huawei has now made a successful sales of 9 million units. “The last three months since its launch, the Huawei P9 has received massive response on its innovation in technology and cutting edge design from key opinion leaders in the media. Post the manufacturing announcement and the launch of Huawei P9 we have seen a considerable increase in the footprint of our consumer base. India is a very important market for Huawei and the company has renewed its focus on India by introducing its manufacturing plant in India. Triumphing over the 9 million unit sales is yet another honor to the brand. We further look at exploring deeper in the nuances of technology to reiterate Huawei’s commitment to customer satisfaction,” said Peter Zhai, President, Huawei India Consumer Business Group. The Huawei P9 was voted the best European Consumer Smartphone in 2016-2017 by The European Imaging and Sound Association (EISA). It also won the ‘Best Dual Lens Smartphone’ at the TeknoTel 2016 Awards, held in Dubai. The TeknoTel Awards are presented every year and are open for the public to nominate and vote for the industry’s outstanding brands and products. The combination of beautiful design, powerful hardware, and innovative camera gave the Huawei's flagship an edge over the flagship competition. This year has been a series of stepping stones for Huawei in India and Globally.